While the Turkish president celebrates his re-election, we can reason that the results point to a difficult future for Erdogan and his party, due, in part, to Erdogan’s rhetoric that emphasized personality over ideas and loyalty over concern for the nation. 1. Erdogan’s party lost its majority. In the re-do votes of November 2015, the Justice and Development Party (AKP) won 316 seats. It only needed 276 seats to form a majority government on its own. It should be noted that during the earlier June elections, the AKP also lost the majority and Erdogan ordered a redo to regain it. This time, too, the AKP needed 300 seats to have a majority in the parliament that would back up decisions by the executive president. It secured only 295 seats. The AKP is now at the mercy of its partner, the Nationalist Movement Party (MHP), which won 11.1% of the votes, entitling it to 43 seats. This is a first for the AKP since 2002. 2. The People's Democratic Party (HDP), increased the number of its MPs from to 59 to 67. 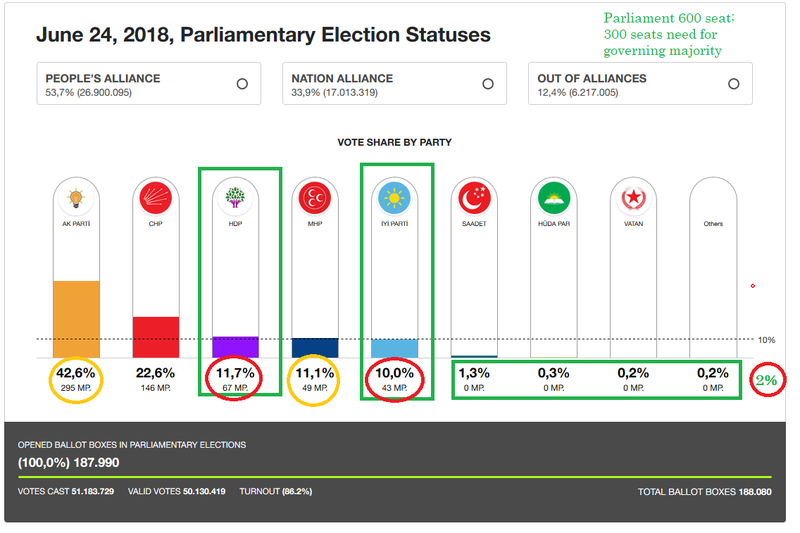 The pro-Kurdish people party, whose leader is imprisoned on “terrorism” charges is now the third largest party (based on the percentage of votes) in the country. It would be highly damaging to Turkey’s standing in relations to civil and human rights to continue to persecute its leader, Selahattin Demirtaş. 3. 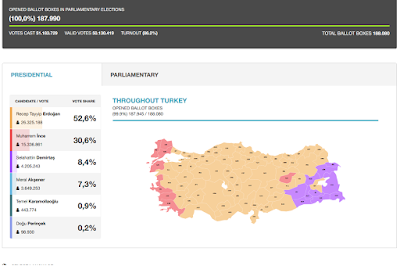 Despite the loss of majority, Erdogan managed to keep the AKP party together thus far. However, the loss marks a hard ceiling that the AKP cannot breach. 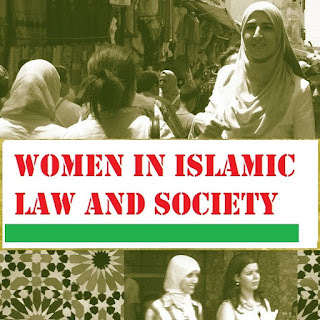 During the past 15 years, the AKP benefited from the election law rule that allowed them to fold-in seats of political parties that did not reach the 10% threshold. But it never won a true majority. Now with the emergence of a second center-right party, the IYI Parti, it will be even more difficult for the AKP to win a governing majority on its own. Therefore, the future of the party will remain closely tied to the performance and standing of Erdogan. 4. 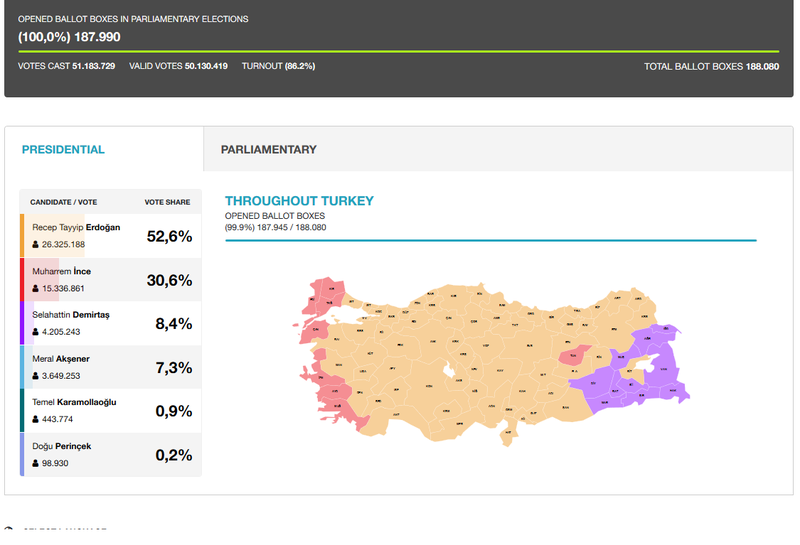 The election results show that, while Turkish citizens are highly mindful of the importance of elections (86% turnout), Turkish voters are consistent in voting for their party. This fact should worry Erdogan because his agenda will be checked by the leader of the MHP. Although the MHP controls only 43 seats compared to AKP’s 295 seats, the MHP party leaders are likely to ask for some key posts in the next administration. The health of this alliance can be checked by the outcome of the negotiations for cabinet positions. 5. Although the AKP remained united during this electoral test, there are signs that show that a strong Islamist party is likely to emerge in the future should Erdogan continue his erratic foreign and economic policies. 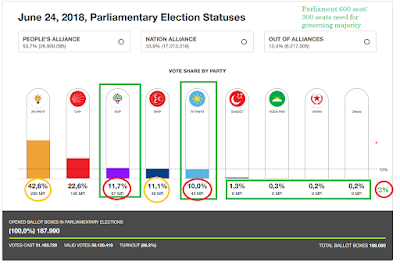 While Saadet party performance was poor, the fact that it garnished 1.3% of the votes without fielding any of former AKP possible defectors signal the potential for the emergence of a plurality of Islamist-leaning political parties. We believe that that will be good for the health of Turkish democracy.